A StationaryResults object contains the solution of a PDE and its gradients in a form convenient for plotting and postprocessing. A StationaryResults object contains the solution and its gradient calculated at the nodes of the triangular or tetrahedral mesh, generated by generateMesh. 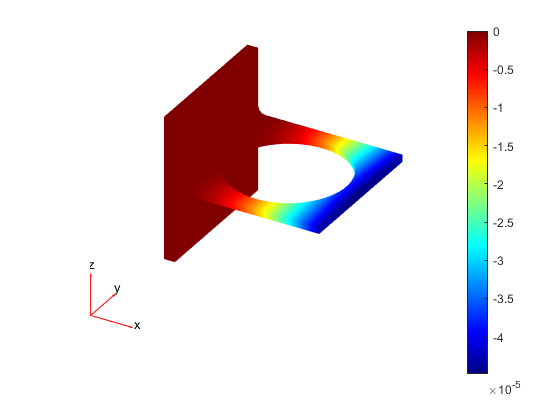 The array dimensions of NodalSolution, XGradients, YGradients, and ZGradients enable you to extract solution and gradient values for specified equation indices in a PDE system. Solve a time-independent problem using the solvepde function. This function returns a PDE solution as a StationaryResults object. This is the recommended approach. Solve a time-independent problem using the assempde or pdenonlin function. Then use the createPDEResults function to obtain a StationaryResults object from a PDE solution returned by assempde or pdenonlin. Note that assempde and pdenonlin are legacy functions. They are not recommended for solving PDE problems. Set boundary conditions such that face 4 is immobile, and face 8 has a force in the negative z direction. Set coefficients that represent the equations of linear elasticity. 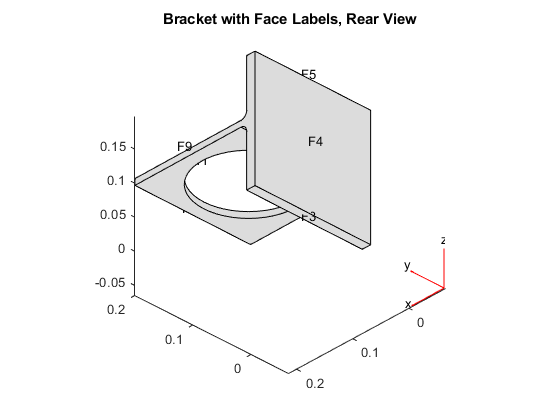 See 3-D Linear Elasticity Equations in Toolbox Form. Obtain a StationaryResults object from a legacy solver together with createPDEResults. Set boundary conditions such that F4 is immobile, and F8 has a force in the negative z direction. Set coefficients for a legacy solver that represent the equations of linear elasticity. 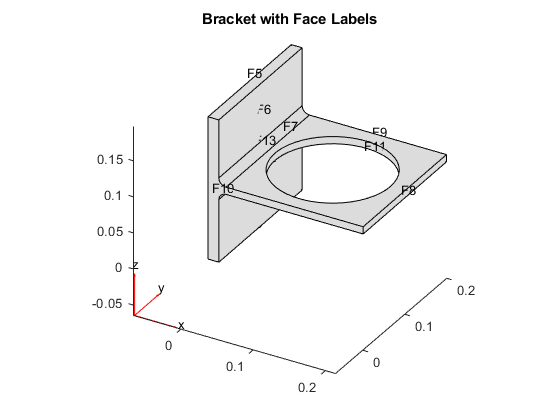 See 3-D Linear Elasticity Equations in Toolbox Form. Solve the problem using a legacy solver.